... 1492 (520 years ago today), occurred what's known as la Reconquista, the "reconquest" of Spain. 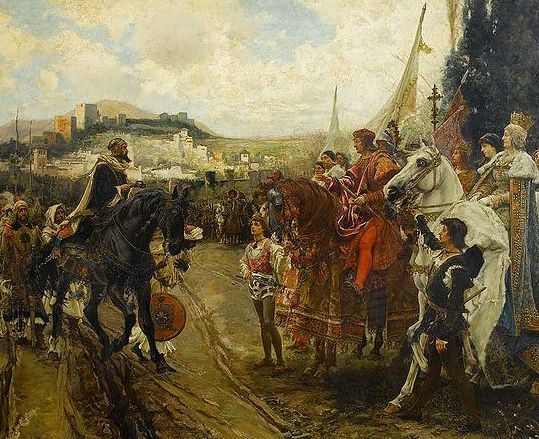 Christian troops seized Granada, the last Moorish stronghold in Spain. The surrender of Granadan King Boabdil to Spanish King Ferdinand V and Queen Isabella I marked an end to Moorish control that had begun in the 11th century. (credit for detail from "Capitulation of Granada," an 1882 painting by Francisco Pradilla y Ortiz that depicts the monarchs on either side) The aftermath was harsh: "in 1502 the Spanish crown ordered all Muslims forcibly converted to Christianity"; the ensuing "century saw a number of persecutions, and in 1609 the last Moors still adhering to Islam were expelled from Spain."